April is a month when there’s no denying winter’s retreat. Even if the thermometer dips below freezing, it rarely stays there for long. Days stretch longer, too. For local plants and animals and the wildlife enthusiasts who observe them, it’s a very busy time. Washington, D.C. is a capital city not only in the geopolitical sense, but also in a much more animated way. Its location, chosen by George Washington as the best place for a seat of government and commercial hub, also serves the naturalist very well. Washington hosts a staggering array of living creatures thanks to this happy combination of factors: it sits between north and south, at the confluence of two rivers, and along the fall line where piedmont meets coastal plain. Grab a backpack, a pair of binoculars, and a handy field guide (may I recommend my book? ), and you will see what I mean. Let’s start with some famous flowering trees. Most tourists hope to visit Washington, D.C. in spring. It’s always a gamble planning ahead and trying to be in town when the cherry blossom trees bloom. Here are some insider tips for cherry blossom watching this time of year. First, keep an eye on the National Park Service web page, where you can find updates on predicted bloom dates. Of particular interest is the predicted date for peak bloom, when 70 percent of the Yoshino cherry tree blossoms (pictured above) are open. Top spots for viewing include the Tidal Basin and the Washington Monument. But you also want to visit East Potomac Park, where you find not only the Yoshinos but also the later-blooming Kwanzan and other ornamental cherry varieties. All of these locations are detailed in the Field Guide to the Natural World of Washington, D.C. Following the ferocious winter, this year, the cherry tree experts predict the Yoshinos’ peak bloom will fall between April 8 and 12. Last year’s peak hit within this window, on April 9. The year before was an early March 20. But when it comes to wildlife—and I’m not talking the bar scene here—Washington, D.C. is so much more than Yoshino blooms. Below are just a few highlights. All locations mentioned here are detailed in the field guide, including visiting tips and key wildlife-watching locations, as well as identification tips. Millions of tulips and daffodils blooming in various parks, including along the George Washington Memorial Parkway (Lady Bird Johnson Park in particular) and at the National Arboretum, Dumbarton Oaks, the National Zoo, and many other places. 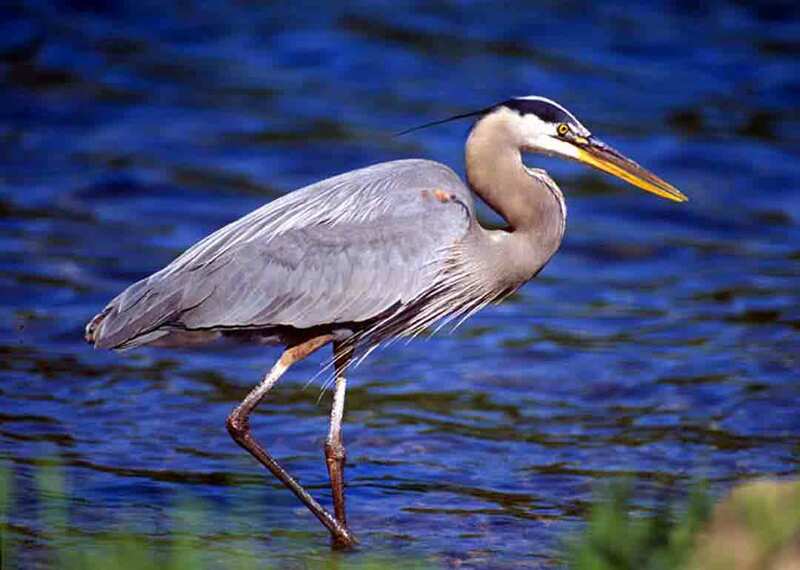 Walk the C&O Canal tow path and keep your eyes open and your ears ready for abundant bird song. Early this month, the adjacent Potomac River provides a corridor for migrating waterfowl and hawks. After the third week of April, neotropical migrants arrive, stake claim to territories, and begin building their nests. These birds include Baltimore and orchard orioles, warbling vireos, yellow-billed cuckoos, great crested flycatchers, and scarlet tanagers. Barn, tree, and northern rough-winged swallows arrive shortly before these species. For other creatures, the business of raising young is well underway. During April, many birds fledge their young, including five woodpecker species, American robins, blue jays, European starlings, Carolina chickadees, and common grackles. Young eastern gray squirrels frisk about. Rare sights in winter, eastern chipmunks and woodchucks (or groundhogs) become familiar sights again in Rock Creek Park, Fort Dupont Park, and other green spaces. Temperature also plays a role. Temperatures above 60 degrees mean dragonflies will be active and bats will be wheeling around at dusk. Above, say, 50 degrees, you may hear tiny frogs called spring peepers “beeping” in low, wet areas, or hear the long trill of breeding American toads. Warm, sunny days draw out the local reptiles, including eastern painted turtles, common water snakes, and striped lizards called five-lined skinks. April also heralds the widespread return of insects. Eastern tent caterpillars’ gauzy nests appear in the crotches of cherry and other trees. Nesting and migrating birds such as cuckoos and orioles feast on this easy protein source, while tiny blue-gray gnatcatchers gather some of the caterpillar nest silk for their own cup nests. Spring ephemeral wildflowers accent floodplain forests this month. These include mayapple, Virginia bluebells, Dutchman’s breeches, and spring beauty. But April is just a great head start for anyone interested in Washington, D.C.’s varied wildlife. At any season, there is much to see here. At the National Arboretum, for example, you will find something in bloom most months. Even in the dead of winter, sparrows, woodpeckers, hawks, and ducks liven up the landscape. For those who care to look, every day in Washington, D.C. is a celebration of nature. It’s easy to escape the grind by retreating to the city’s many parks. Any naturalist knows that, when it comes to wildlife, Washington is truly a city that never sleeps. 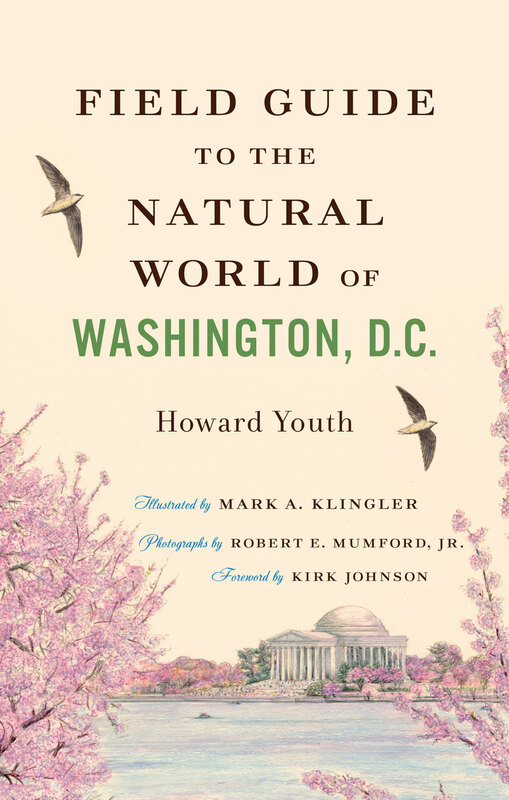 Howard Youth is the author of Field Guide to the Natural World of Washington, D.C. He is a freelance natural history writer and former associate editor and communications manager for the Friends of the National Zoo. His work has been published in Audubon magazine, National Wildlife, and the Washington Post. The book’s illustrator, Mark A. Klingler, is a natural history artist in residence at Carnegie Museum of Natural History and illustrator of Field Guide to the Natural World of New York City, also published by Johns Hopkins. The book’s photographer, Robert E. Mumford, Jr., is a wildlife photographer whose work has appeared in Birder’s World, Smithsonian Zoogoer (the National Zoo’s magazine), and the New York Times.